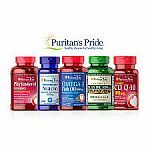 Puritans Pride is having 48-hr sale: Buy 2 get 3 Free + extra 30% off Puritan's Pride items with promo code "WELWED5". Shipping is free with $35+ orders. Deal ends 4/17. Puritans Pride has Up to 80% Off Sale. Also, Buy 2 Get 3 free on select items. Shipping is free with $49. (Today Only) Plus Extra 24% off w/ code "POP2019"
Puritans Pride has select top sellers for up to 85% off. Plus, get a free bottle of CO Q-10 & Cinnamon 30 softgels with $49 or more purchase. Shipping is free on orders $49+. Deal ends 2/19. Puritans Pride is offering Buy 2 Get 3 FREE on Puritans Pride brand items. Plus, get an extra 25% off on $49+ purchase with promo code "CATOFF3". Shipping is free. Plus Extra 20% off w/ code "JAN2719"
Puritans Pride has Up to 30% Off Select items + Buy 2 Get 3 Free, Buy 1 Get 1 Free. Shipping is free with $49. Puritans Pride has Buy 2 Get 4 Free, Buy 1 Get 2 Free. Shipping is free with $35. Extra 20% off with code "SAVEDEC"
Extra 20% off with code "BFF1123"
Puritans Pride has sale items for up to 85% off. Take an extra 17% off with promo code "BLACK80". Shipping is free.